Adapted from a Market Day recipe. Easy alternative to lasagna, can be customized in many ways to suit your family's tastes! 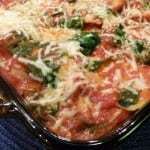 Substitute different sauces for the marinara or different vegetables for the spinach. Have fun with it and enjoy! Before draining ravioli, stir in the spinach until wilted. Drain ravioli and spinach mixture. Combine the crushed red pepper and marinara sauce. Spread about half of the marinara mixture over the bottom of an 11x7 baking pan. Spread about half of the ravioli/spinach mixture over the sauce. Sprinkle about half of the cheese on top. Add another layer with remaining ravioli/spinach, then top with remaining sauce. Cover baking pan with foil and bake for 25 minutes. Remove foil and top with remaining cheese. Bake uncovered for an additional 5 minutes.